Congressman Pat Tiberi offers his outlook for the next two years in Washington and what that means for REITs. With Republicans winning back the U.S. Senate in last fall’s elections, the focus in Congress has shifted to how the House of Representatives and Senate may work together to pass legislation. Also, talk has turned to how the GOP will use its newfound power to make policy as Democratic President Barack Obama enters the last 24 months of his time in office. The REIT and real estate industry will be monitoring a slew of percolating political questions as the 114th Congress starts work. As a senior member of the House Ways and Means Committee, Rep. Pat Tiberi (R-OH) is very aware of what those issues are and how the change in leadership could affect them. Tiberi represents the 12th District of Ohio, which includes portions of Columbus and the surrounding area in central Ohio. Long an advocate for the REIT approach to real estate investment, Tiberi sat down with REIT magazine to preview the potential action in this session of Congress and discuss how it might impact REITs. REIT: Over the years, you’ve been a strong supporter of REIT-based real estate investment. Would you please explain why? Rep. Pat Tiberi: I have a real estate background and am probably more exposed to REITs because of that and central Ohio being such a REIT-friendly environment. Obviously, one of the premier REITs is located in Columbus, Glimcher Realty Trust (NYSE: GRT), which has been around for a while and is pretty active in the community. That exposure and knowing the Glimcher family before I got elected to Congress has been helpful in understanding the REIT business probably more than the average member. REIT: You’ve backed legislation in the past to reform the Foreign Investment in Real Property Tax Act (FIRPTA) rules governing cross-border investment in U.S. real estate. Why do you think these rules need to be amended, and do you see any possibility on the horizon of FIRPTA reform moving forward? Tiberi: I sure hope so. Capital is so important in growing our economy. The more you tighten the ability of capital to flow, it’s going to go elsewhere. My belief is that the more you can allow capital to work, the American economy will benefit. Capital will flow elsewhere if we tax it higher or regulate it more than what other countries are doing. If we can allow more flexibility in the way capital flows to U.S. REITs across borders, I think it’s a good thing for economic growth here. REIT: What are your thoughts on the prospects for comprehensive tax reform in this session of Congress? Tiberi: We have an opportunity with [new House Ways and Means Committee Chairman] Paul Ryan (R-WI) and the Republicans taking the Senate to do comprehensive tax reform. We have willingness among the members of the Ways and Means Committee and the Republicans on the Finance Committee in the Senate to do comprehensive tax reform. We’re going to find out if the president is serious about doing some big things, and tax reform is one of those big things. I think you’ll see us be very active, and whether it gets across the finish line is up to the president and his team. We’re going to do tax reform. The question is not if, it’s when. REIT: How do you view REITs fitting into your conception of tax reform? Tiberi: Anything we can do to encourage and expand the ability of REITs to continue to grow is something that I think legislatively we should encourage. There certainly has been some controversy with a few industries that are using the laws to become REITs that are not traditional REITs. There’s some concern about how we treat them. But setting that aside, I think we need to try to figure out how we can form a tax code that not only doesn’t pick winners and losers, but allows investment decisions to be made based upon the investment decision, not the current tax code—one that encourages economic growth, that encourages people to make investments, and encourages capital to flow into America. Anything we can do to make it more advantageous for investors, I think, is a good thing ultimately for the economy and for job growth. The good news is that Paul Ryan agrees with that as well, so I think that’s good for REITs in America. REIT: During the most recent session of Congress, the House passed dozens of bills that the Senate did not pass or even seriously consider. Likewise, the Senate passed many bills—ranging from immigration reform to Marketplace Fairness to patent reform—that the House didn’t pass. Do you have any confidence that the two bodies will cooperate now that both are under the control of the Republicans? I’m not one of these folks who thinks that just because the Senate is in the control of the Republicans it means that they’re going to agree with us on everything. They still have a 60-vote threshold that they need to get on a whole lot of things, so at the end of the day, there’s going to have to be bipartisan support in the Senate. But this can be bipartisan with the proper presidential leadership. The reforming of our tax code is something that has been bipartisan in the past, but it takes engagement by the White House. Thus far, we haven’t seen it in six years. REIT: On a related note, what are the chances of the Marketplace Fairness Act passing to help level the playing field between online and brick-and-mortar retailers? Tiberi: Like tax reform, I think the question is when, not if. Ultimately, this is going to have to be dealt with. [House Judiciary Committee Chairman] Bob Goodlatte (R-VA) has been trying to come up with a compromise. Obviously, the opposition by some Internet businesses is pretty heated, but, again, I think there has to be some sort of compromise on this to allow Main Street businesses to be able to compete in an economy that continues to change in the way that people buy and sell things. The Internet is something that I don’t want to overregulate, but at the end of the day, it’s a fairness issue. Hopefully, the message has been sent to Chairman Goodlatte that he really has to come up with a compromise and get everybody in a room and try to hash out something sooner rather than later. REIT: How have you seen REITs impact the local economy in your home district and the state of Ohio? Tiberi: All you have to do is drive up to part of my district called Polaris in northern Columbus and you see two different REITs, DDR Corp. (NYSE: DDR) and Glimcher Realty Trust, operating a large shopping center and a large mall right across from each other. In that Polaris area, these two REITs have really sparked an economic development boom with restaurants and office buildings and a whole lot of other things that have followed. It’s one of the fastest-growing areas of our state, certainly in the region. That doesn’t just happen by accident. It was the Glimcher family’s Polaris mall [Polaris Fashion Place] that actually started the boom in this area. It’s phenomenal what has happened in that part of our region, and it has become an area of our region that attracts people from hours away to go do their shopping. Discussions of fundamental federal tax reform have occurred all across Capitol Hill since President George W. Bush won his second term in office in 2004. Yet, actual progress toward overhauling the tax code in the last decade is harder to find. Even though the GOP now controls both the House and Senate, the likelihood of major reform over the next few years seems unlikely without agreement between President Obama and Congressional Republicans. Sales and use tax collection parity between traditional storefront retailers and remote sellers remains a key objective for the REIT industry. In 2013, the Senate passed the Marketplace Fairness Act (S. 743), a bill that would allow certain states to impose sales tax collection responsibility on online retailers. A House version of the bill (H.R. 684) has yet to advance beyond the House Judiciary Committee. The real estate industry has long pressed Congress for reforms to the Foreign Investment in Real Property Tax Act of 1980 (FIRPTA) rules. Under FIRPTA, the U.S. taxes non-U.S. persons on dispositions of U.S. real property interests, including sales of REIT stock­—a tax burden placed on no other U.S. industry. The rules have proven to create a major roadblock to equity investment in U.S. real estate by non-U.S. investors. In 2013, Senate Finance Committee members Robert Menendez (D-NJ) and Michael Enzi (R-WY) introduced the Real Estate Investment and Jobs Act of 2013 (S. 1181), while House Ways and Means Committee members Kevin Brady (R-TX) and Joseph Crowley (D-NY) introduced a companion bill (H.R. 2870). The legislation included measures aimed at lessening some of the obstacles to cross-border real estate investment created by FIRPTA. The White House’s 2015 budget also included a proposal to exempt certain gains for non-U.S. pension funds on the disposition of U.S. real property interests from U.S. tax under FIRPTA. In the wake of the 9/11 terrorist attacks on the United States, Congress in 2002 passed the “Terrorism Risk Insurance Act” (TRIA), which was designed to create a temporary federal reinsurance mechanism to help insure against losses resulting from a foreign terrorist attack. The program expired at the end of 2014. 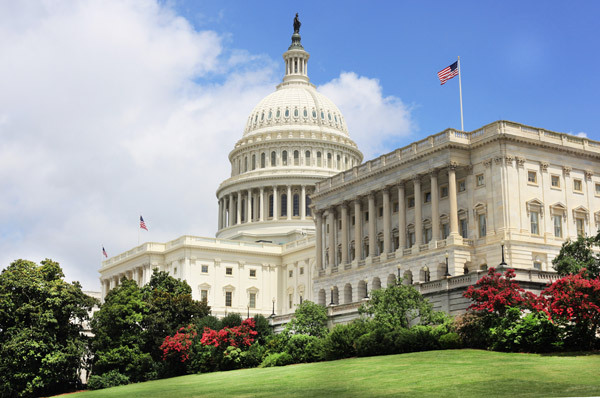 The House and Senate passed a bill during the new session of Congress in January, that President Obama signed into law, that extends the TRIA program through 2020.